Earlier this week, I had the great privilege of speaking on a panel about gerrymandering and data visualization at Tufts University as part of an ongoing workshop organized by Professor Moon Duchin and colleagues. I promised the audience that I’d post my slides, so here they are! I’ve also written up a short walk-through of the presentation for those who couldn’t be there below. As most of y’all know, I’m a computational epidemiologist (and enginerd) by training. In short, this means that I use non-traditional data sources like news and social media to better understand trends in public health… But how does this apply to gerrymandering? In public health, we believe that awareness is critical to enabling and ensuring public-centered action. Citizen phone calls to state representatives are just one example of this within the context of gerrymandering. 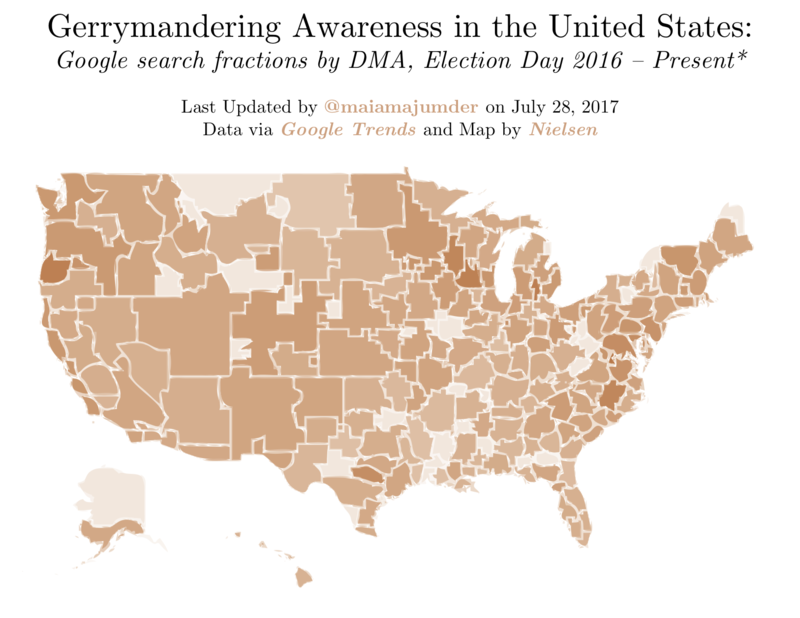 With this in mind, the questions I’m most interested in when it comes to gerrymandering – and the data, methods, and visualizations I’ve used thus far to start addressing them – are largely centered on awareness. Does awareness of gerrymandering vary across the US? And if so, does awareness of gerrymandering correlate with presence of gerrymandering? But, thinking back to Question 2: is this heterogeneous pattern of awareness representative of gerrymandering itself? 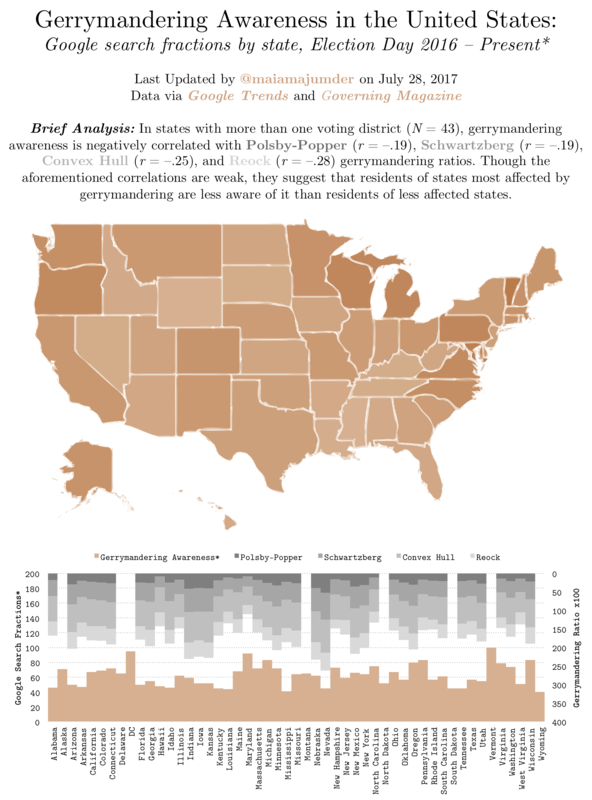 To address this question, I combined the aforementioned gerrymandering awareness data – this time, at the state-level – with state-level gerrymandering metric data and ran a quick regression analysis to see whether or not a relationship existed. In the multi-panel dataviz shown at left, I’ve charted volume-adjusted search interest in gerrymandering by state (in orange) against various state-level gerrymandering metrics (in gray). To the right are correlation charts for each of the four gerrymandering metrics shown, plotted against our gerrymandering awareness proxy for any state with more than one voting district. Polsby-Popper is shown top left, Schwartzberg is top right, Convex Hull is bottom left, and Reock is bottom right. As is easy to see in each correlation chart, awareness of gerrymandering seems to be negatively correlated with presence of gerrymandering; in other words, states with more gerrymandering seem to be less aware of it than states with less. Though this relationship is weak, it’s meaningful because it’s the opposite of what we want to be seeing. So, why is this happening? Why are folks living in heavily gerrymandered states less likely to be aware of gerrymandering, and how can we develop interventions to mitigate the situation? I don’t think we have an answer to this question yet, but my colleagues and I are working on it! One thing is certain, though; we have an awareness problem on our hands. The first half of this approach is largely contingent on how those of us that are working on the gerrymandering problem choose to spend our (limited) resources, which is a longer conversation that’s best saved for another day. 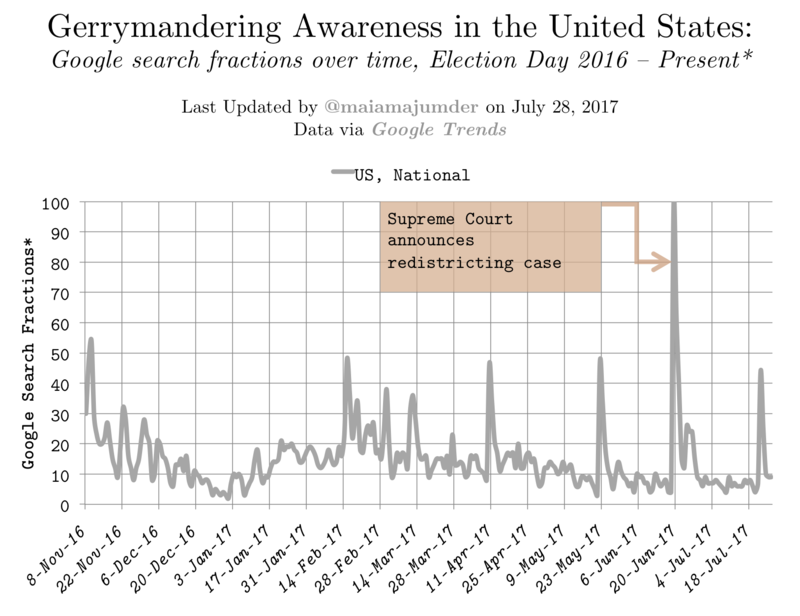 But when it comes to the second half of the agenda, one possible way to monitor and evaluate awareness campaigns about gerrymandering is to turn once more to Google trends. To the left is a look at how Google volume-adjusted search interest in gerrymandering has changed at the national level between Election 2016 and present. As can be seen here, the most recent peak in interest was on June 19th, when the supreme court announced that it would be taking up an important redistricting case involving line-drawing in Wisconsin, which may have resounding repercussions for the rest of the United States. Ideally, we’d like to see awareness campaigns prompt peaks in search interest similar to this. Granted, the national scale isn’t granular enough to tell us about localized awareness interventions, so to the right is a timeline of how volume-adjusted search interest in gerrymandering has changed in Massachusetts, too. Clearly, statewide interest adheres pretty closely to national interest over time… But if we take a look at June 22nd, we see that Massachusetts experienced a small secondary peak following the aforementioned June 19th peak that the US in general didn’t. 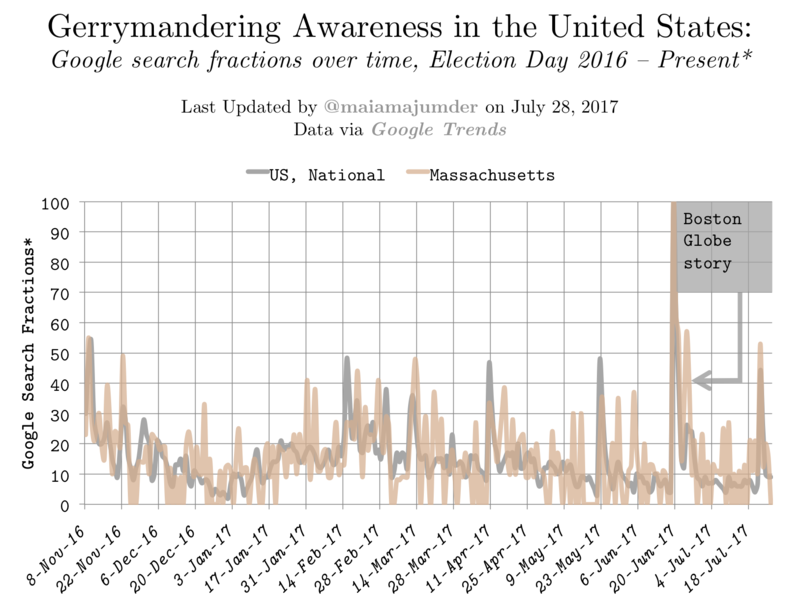 This seems to coincide with an excellent piece published in the Boston Globe about the “Gerry behind gerrymandering“, which is just one terrific example of how a more localized event – or intervention – can prompt a measurable signature in the search interest – and awareness – of citizens. 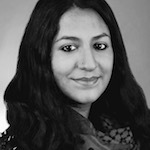 As we start to think about how awareness campaigns should be designed to best meet the needs of those that are most affected by gerrymandering, let’s keep in mind the role that non-traditional data sources like Google trends can play in providing an awesome, low-cost alternative to more conventional intervention monitoring and evaluation methods. When resources are limited, it pays to get creative! Note: Download high-resolution versions of the figures cited above here, here, here, here, and here.